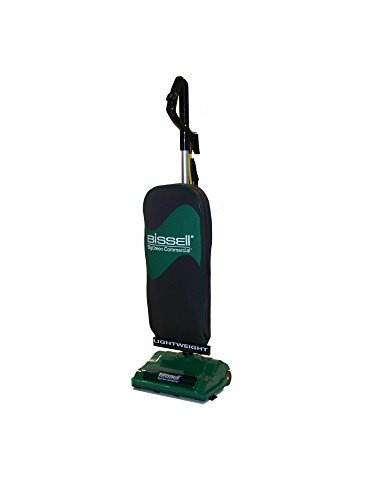 The Sanitaire SC679J Commercial shake out bag upright vacuum cleaner is lightweight( 12 lb. ), has a 5 amp motor that delivers 120 cubic feet per minute (CFM) of air flow, and has an 18 dry quart capacity Tietex fabric shake-out bag that can be emptied and reused to save costs associated with disposable bags. The handle has an automatic locking system with a foot pedal release for usability, and drops down flat for cleaning under furniture and for storage. This vacuum cleaner has earned a Carpet and Rug Institute (CRI) Seal of Approval (bronze rating) for soil removal and indoor air quality in the commercial use vacuum category. The height of the vacuum cleaner can be manually adjusted to four positions to accommodate different flooring surfaces. The vacuum collects debris in an 18 dry quart capacity standard filtration fabric shake-out bag for more vacuuming time between bag emptying than cleaners with less debris capacity. The 30-foot power cord enables the vacuum to cover a larger area without changing outlets than vacuums with shorter cords, and the cord-wrap hooks on the handle hold the cord for storage. This upright vacuum cleaner is better suited for cleaning carpets than typical canister vacuums and takes up less storage space. The foot-operated power switch is mounted on the motor hood. A furniture guard bumper helps prevent damage to furniture and walls. The vacuum cleaner operates at a sound level of 78 decibels. The vacuum requires assembly; instructions included. Vacuum cleaners have electric motors that generate suction to remove dust, dirt, and debris from floors and other surfaces. The dirt is collected in a dust bag (either disposable or reusable), a cyclone, or another chamber for disposal. Intake and exhaust air is usually filtered to keep dust particles from clogging the motor or being released back into the air. HEPA (High Efficiency Particulate Air) and ULPA (Ultra Low Penetration Air) filters are used for applications that require the filtration of very fine particles. Vacuum cleaners are available in a variety of styles, including upright vacuums, canister vacuums, backpack vacuums, and wet and dry vacuums. Vacuum cleaners may have residential, commercial, or industrial applications. Sanitaire manufactures vacuum cleaners for home and commercial applications. The company, founded in 1972, is headquartered in Charlotte, NC.